This looks like the last week of 70 degree weather. Beekeepers should check their hives winter stores. 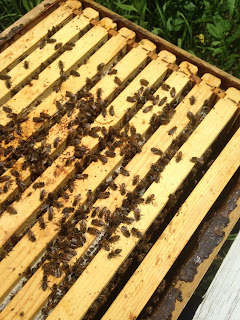 This warm weather may have made the bees consume more food than normal. Topping off the hives food supply may have to be looked at. The extended forecast has the temperatures staying in the 60's for a couple weeks, then cooler as the days move closer to November. As the weather cools beekeepers that still have work to do will be finding it a little harder to get syrup into the hive. Feeding needs to be completed as soon as possible. The bees do not like cold syrup and they will be reluctant to take the syrup down. It looks like there is about two good weeks of feeding ahead, after mid October the bees may be reluctant to take syrup very well. The top deep box should be full of honey right now. Feeding is needed if the colony is light on food stores. If the outside frames are empty. Moving the empty frames to the center of the box and full frames to the outside of the top box. The bees seem to fill the frames better if they are in the center of the box. Mite treatments are more limited in the colder weather. Apivar and Hopguard can be used as they are contact strips and don't depend on warm weather for them to be effective. Oxalic Acid has been approved for use in MN. 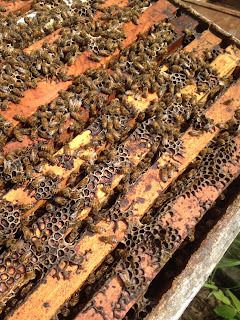 Oxalic acid can by used around mid October, when a hive becomes broodless. Oxalic acid only kills mites that are directly on the bees. Mites that are in brood cells are not killed by the Oxalic acid treatment. When hives are fed late, the queen will continue to lay. The nectar flow produced by feeding will stimulate the queen to lay eggs. 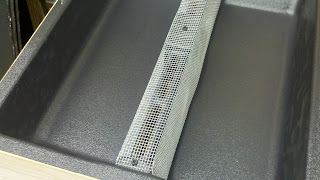 Plan on having brood in the hive about thirty days after feeding. With the cooler weather moving in, entrance reducers should be put on colonies to keep mice from moving into the colonies. 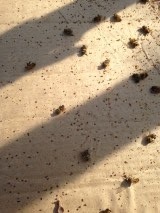 The warm weather is helping beekeepers get their mite treatments and feeding done. 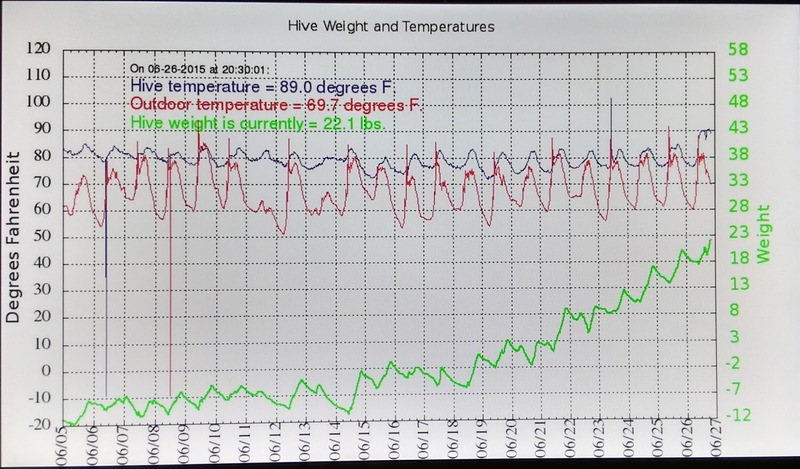 Hives that were light on bees, have had an opportunity to build up to larger numbers. Beekeepers using ApiGuard and Mite Away Quick Strips (MAQS) have been getting the heat they need for the mite treatments to work properly. 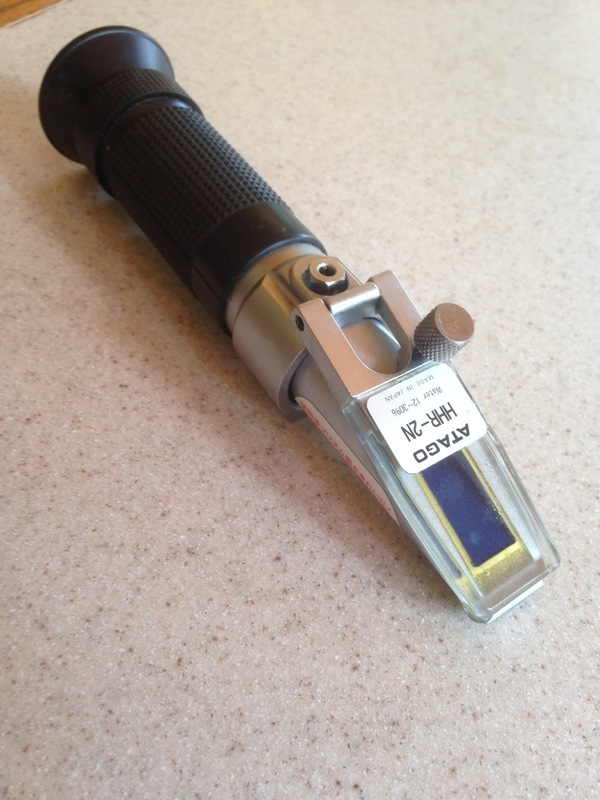 After a mite treatment, a test to see if the treatment worked is needed. How to test for Varroa Destructor Mite Levels. 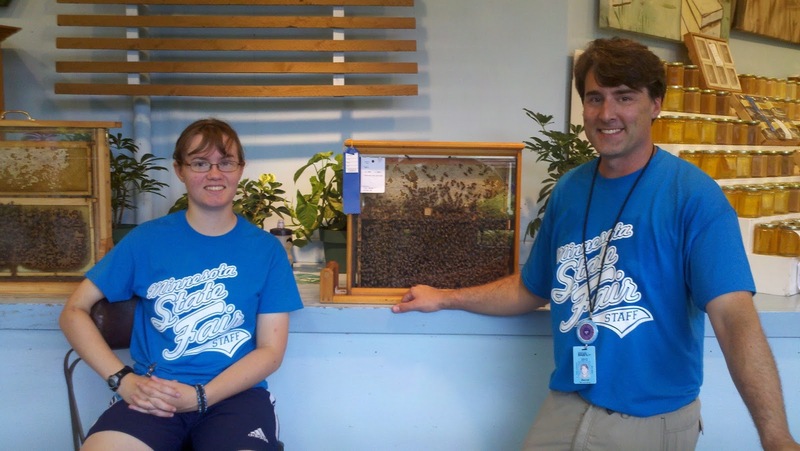 Nature's Nectar LLC does carry the Univ of MN Bee Squad mite test kits. 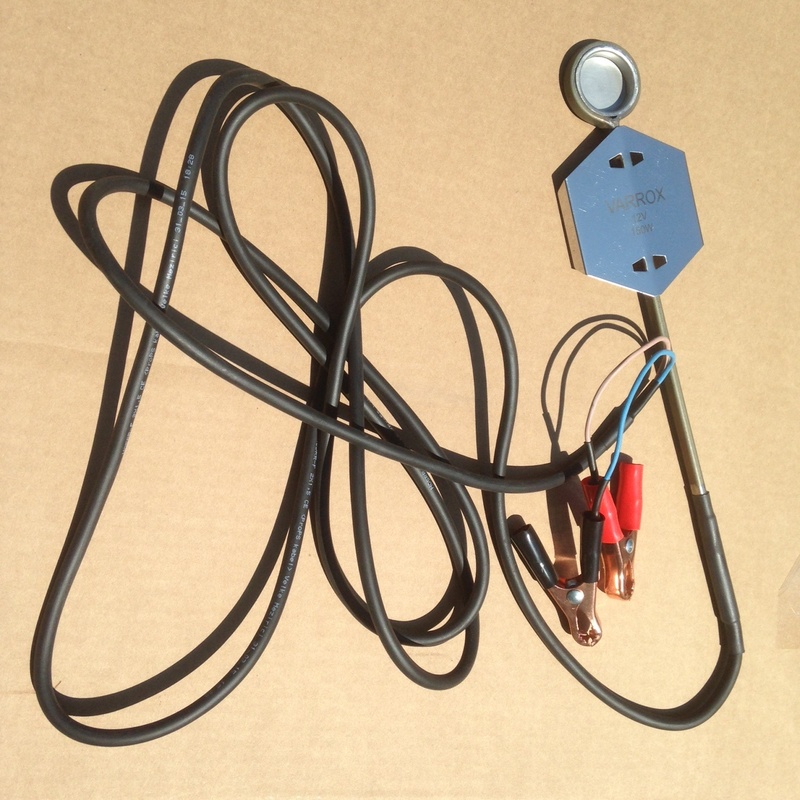 The kits contain everything needed to do a mite test. I had a beekeeper tell me they treated for mites with a mite treatment. Before they treated, they had five mites in the sample. After the treatment they had twenty mites per sample. This particular treatment did not work. Sometimes mite treatments don't work because of weather, hive population or being applied improperly. The beekeeper is now trying another type of treatment. 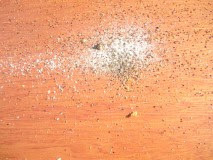 All Varroa Destructor Mite treatments need to be applied according to the manufacturers label. This may be the last week in the 70's. Last week for mite treatment using Mite Away Quick Strips. The 70's help the treatment work properly. Feeding heavy now. The bees will take the feed readily in the 70's. As it cools the bees don't take the feed as well. 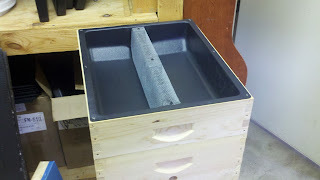 If a beekeeper has to get alot of feed in the hive in a hurry, a hive top feeder works great. They hold four gallons of syrup and the syrup is available to many more bees than a feeder pail or frame feeder. The bees come up from below through the open channels and move down to what ever the level of the syrup is. I have had a few beekeepers tell me they went and checked their bees. They looked great two weeks ago and now there were no bees in the hive and all of the honey was robbed out. There were no dead bees in the hive. All of these absconding colonies most likely had high levels of Varroa. 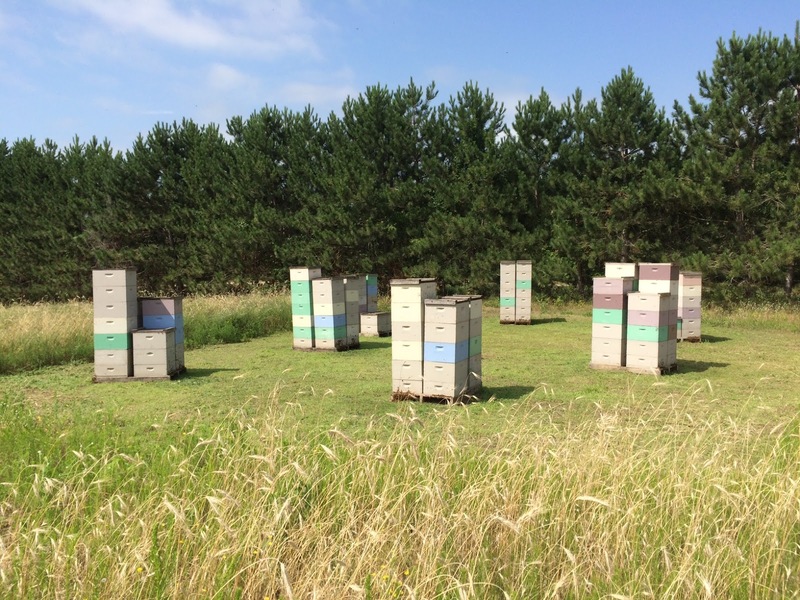 When Varroa levels get high, the bees will drift away. Leaving no bees and unprotected honey. If there were piles of dead bees one could say they were overcome by robbers and the colony was killed in the robbing melee. Failure to treat for mites leads to absconding or a weakened colony that will not survive the winter. Nature's Nectar LLC does rent three frame extractors for $30.00 a day. This is blooming all over in my tree lines. The plant is covered with pollinators. I believe it is from the Joe Pye weed plant family. Note the white pollen on the bees legs. 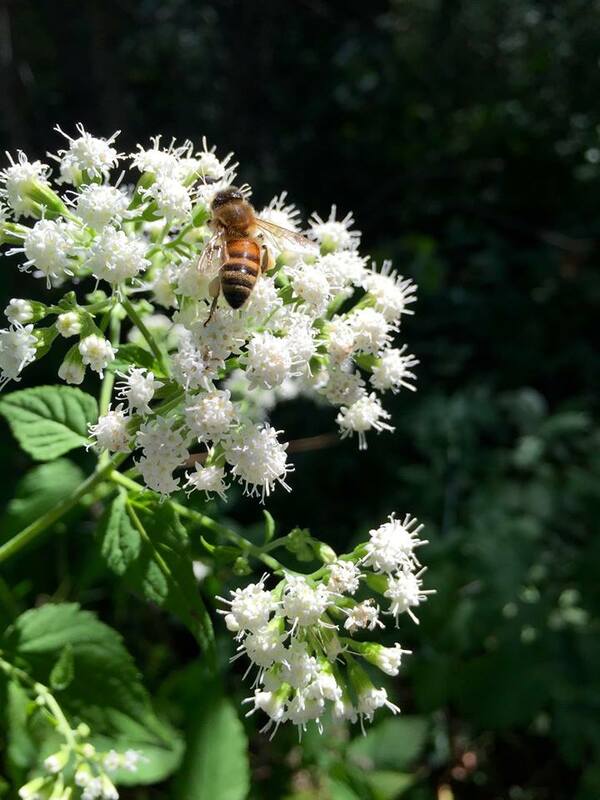 I have been informed by a beekeeper that this is White Snakeroot. Thanks for the plant ID. The window for feeding and mite treatments is getting less every week. Extended forecasts for daily temperatures is heading into a cooler trend. As it cools off ApiGuard and MAQS ( Miteaway quick strips) will not be as effective. ApiGuard and MAQS need warmer temperatures to work effectively. The next week to 10 days will work for MAQS. Starting ApiGuard now would be a bad choice in the twin cities and points north. ApiGuard is a month long treatment and there will not be time temperature wise to get a full treatment regimen in. 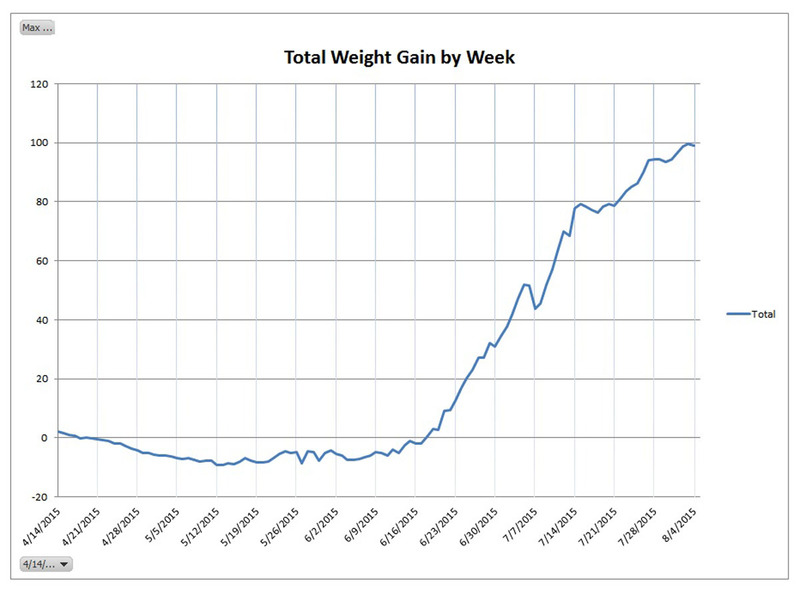 Moving forward, from the third week of September. The options for mite treatments will be ApiVar and Hopguard. Both of these mite treatment are contact strips and will work in the cooler fall daily temperatures. Feeding if needed should be done now. Beekeepers need to get any feeding done as fast as possible. Feeding promotes brood production because it is a nectar flow. Brood will be raised during a nectar flow. A hive can have brood present 30 days after feeding ceases. It is best to get feeding done by late September if possible. Right now the bees will take the syrup down very quickly. As the temperatures cool the bees become reluctant to take it down. The bees do not like cold syrup. Feeding ProSweet instead of sugar water is easier for the bees. ProSweet syrup is just like honey. It has fructose and sucrose. The bees store it in the cells and they are done with refining it. With sugar water the bees have to dehumidify it and turn it into honey. More work and it takes time. Nature's Nectar LLC does carry five gallon pails of ProSweet. The top box should have eight full frames of honey and one partially full frame. The partially full frame should be in the center. The second or bottom box (if in a two deep hive ) should have four full frames of honey, two frames on the outside of both sides of the box. 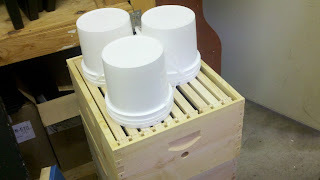 The bottom box of a three brood box hive should have two full frames of honey on the outside ends of the box. 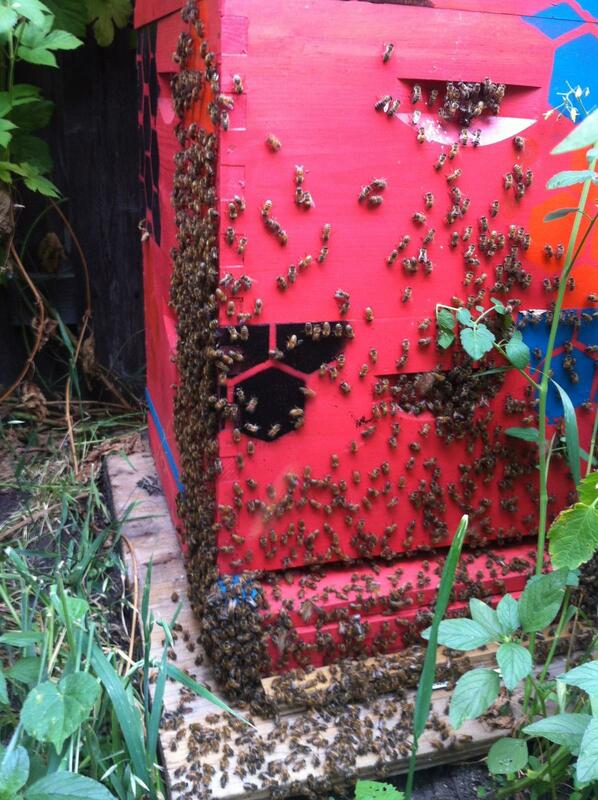 Do not put partially filled boxes on top of a hive. The bees may move up into this box in late winter and starve even though honey is in the box below. 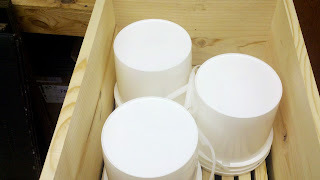 If you have partially filled boxes, place them now on top of the inner cover. The bees will move up and bring the honey down to the brood nest. Feeding ProSweet. The pails now come with an e-z pour spout. 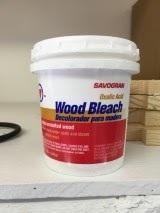 The five gallon lid does not have to be removed. 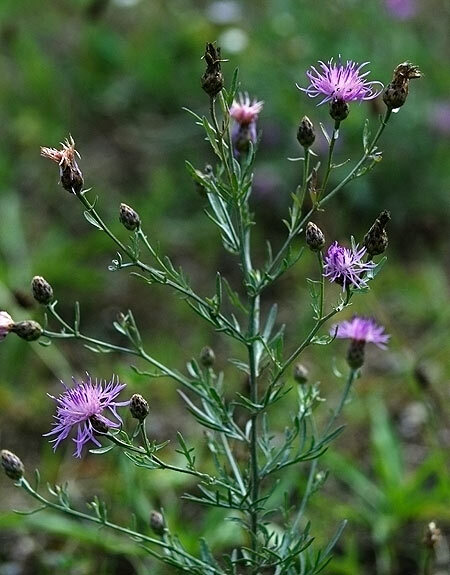 A federal appeals court has overturned the EPA decision to allow the use of Sulfoxaflor. This article was forwarded to me from a beekeeper. What is killing America's bees and what it means to us. The reader should make their own conclusions. 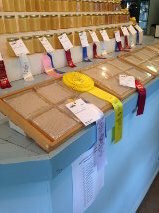 Congratulations to all of the participants at the fair. The beekeepers worked hard to turn in their honey entry. 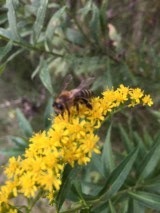 The bees have been bringing in nectar off of the Stiff Goldenrod. They have been working it and I noticed robbing behavoir of my bees is not there at the moment. Other beekeepers have told me their hives smell like wet sweat socks so there is a flow happening. It may be the heat and humidity that kicked in the nectar flow. 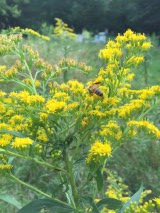 The weather will change next week and the Goldenrod nectar flow may stop with the cooler weather. Volunteers are needed to help at the State Fair. 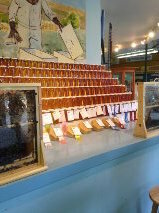 It is a three hour stint at the Bee and Honey display in the Ag Hort building. 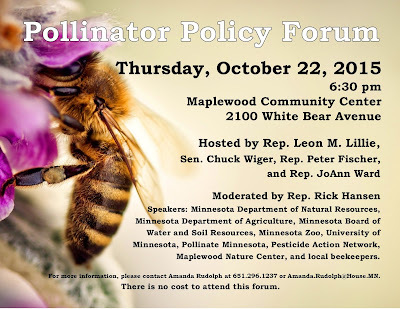 You will be talking to the general public about honey bees. This is a great help for the public to get good information about honeybees from the beekeepers that work the hives. Usually you sit on a chair in front of an observation hive. Everyone wants to see the queen. The queens are marked and are easy to spot. It is in the shade, the doors are wide open and most of the time there is a nice breeze blowing through. So even if it is hot out it is in a comfortable spot out of the sun and weather. You do not have to be an expert. You know more about bees than the public. Give yourself credit. You put the bees in the hive, they grew to an awesome colony, and now there is honey on the hive. The civilians that you will be talking to don't know what a queen excluder is, so any new beekeeper sounds like an expert. If you don't know the answer to a question that is ok, someone there will know it. Every beekeeper that does this comes away from it as a great experience. It is a lot of fun being the expert, because you are one. The nectar flow is still rolling. 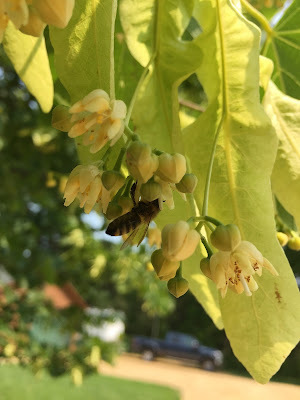 Many early honey plants are still blooming. The late summer flowers are starting to appear. Purple Loosestrife is in full bloom. Purple Loosestrife is a noxious weed and should never be propagated. It can take over a wet land and have a negative effect on the eco system of the wetland. Having said that, Purple Loosestrife is a great honey plant. The honey looks like new motor oil. It has a greenish tint to it. Purple Loosestrife honey has a nice flavor. Sunflowers are blooming. 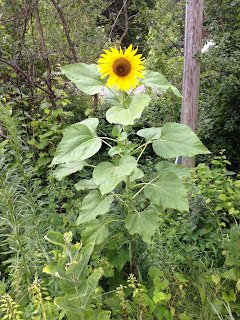 Some Sunflower varieties are very good honey producers while some others are not. The MN State Fair is coming soon. I always encourage beekeepers to make an entry. 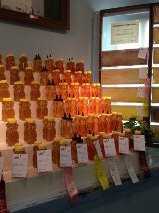 The fair is one of the largest honey and bee displays in the country. This gives MN beekeepers a wonderful opportunity to show the fruits of their labor, while promoting the beekeeping industry. This is the link to the MN State Fair Premium Book. Find the Bee and Honey section. There are many entry possibilities. You can enter as many of the lots as you desire. Only one entry per lot. Always read and follow all the direction in the lot. You do get your entry back. 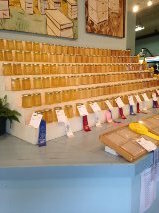 There is a novice class for new beekeepers who have never won a ribbon. Also a Junior lot for kids. More than one child per family can enter the same lot. 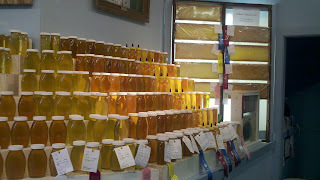 Bottling honey for the fair makes you a better beekeeper. There is more attention to detail because this is competition. 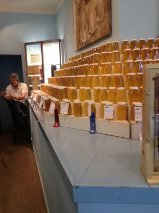 Bottling of honey makes you think of the fair and you tend to bottle a more consistent product. I find it helps to make a schedule to get ready for the fair. Have any honey extracted by early August. Let it set for a couple days for the air bubbles to rise. Bottle a week before the entry is due. Any bubbles rise to the top of the jar. Carefully take a spoon and remove any froth at the top of the jar. Top off the bottle if needed with the same honey. Your entry at the fair will be seen by thousands of fairgoers. All of your friends and family will stop by to see your entry. 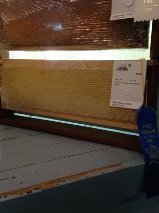 If you win a ribbon you will be able to say that you have the best honey in the State of MN and you have the ribbon to prove it. The nectar flow is still on. If I was going to put a number on it, I would say the nectar flow is about 60 - 65% done at this time. But as we get into the later summer months the flow can start getting a little spotty. A few factors influence the late nectar flow. Some areas have good early summer flows and not great late summer flows. Other areas produce nectar the whole summer. 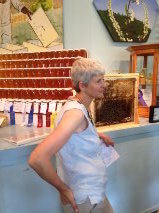 While some beekeepers may only get one type of flow off one particular nectar source and that is it. Some of these factors have to do with moisture conditions. But I think across the upper Midwest our soil moisture conditions are not a negative factor. Usually nectar flows are better when it is a little on the dry side. But I think the good moisture conditions give all beekeepers a better chance of getting a good honey crop. 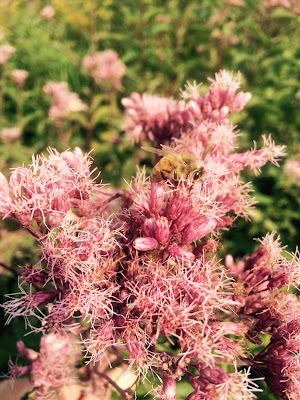 The steady heat we have been experiencing has made the foraging by the bees a more productive endeavor. The bees can get out earlier and longer during the day. The heat makes the plants grow and mature to their full potential. 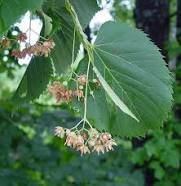 Basswood trees are done flowering. There is still white sweet clover in bloom. It has started to wane in some areas but in other areas it is still going strong. Birdsfoot trefoil is still blooming everywhere. 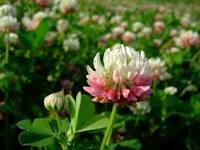 Now late summer flowers will be starting in abundance. Many thistles are in full bloom. Purple loosestrife will be coming out soon. I have started to look for Goldenrod, but I have not seen any yet. Goldenrod will more than likely start blooming in the southwest suburbs soon. As we get closer to August harvesting the honey crop, treating for varroa, and entering the state fair are on the to do list. I can't say enough about the state fair. 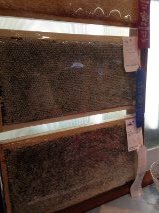 It is a wonderful way to display what a beekeeper has worked hard to produce. There are many possible entries. 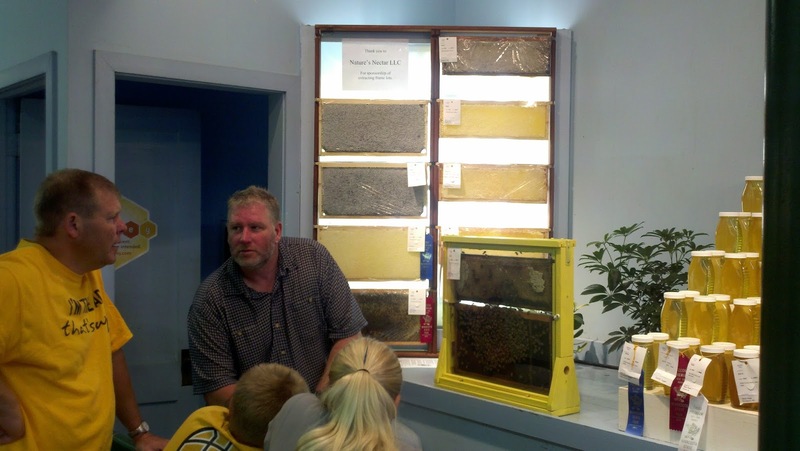 A novice class for beekeepers who have never won a ribbon. Also a child entry to make the show a true family affair. I will be commenting on the fair soon. But here is a link to their premium book with rules, schedules and entry classifications. My friend Brian runs 200 colonies in the northwest suburbs. He has been having a great honey year. 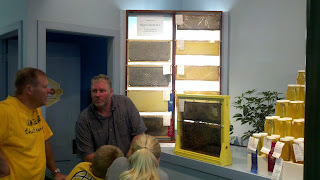 This is a picture of one of his bee yards. He runs one deep and a medium super. His bees winter in Texas. The hives are palletized, with four hives to a pallet. A migratory cover is used for the lid so palletized hives can be stacked on top of them. The pallet of bees can easily be moved with a bobcat and placed on a truck or semi. A semi can hold 800 palletized hives in singles. If you look close, you can see his queen excluders above the second box. Just about everything is full of honey. A deep super has about 90 lbs of honey in the box. Palletized hives. Some hives are doing better than others. My wife and I were out for a long walk this morning. Wendy spotted a Bald Face Hornet nest on a rise next to the Gateway Trail in the city of Grant. Bald Face Hornets are great to have as a neighbor. 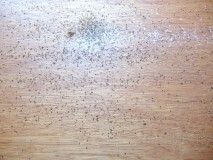 Over 80% of their diet are houseflies, that makes them a good neighbor. I hope they eat deer flies because that would raise their stature even more. 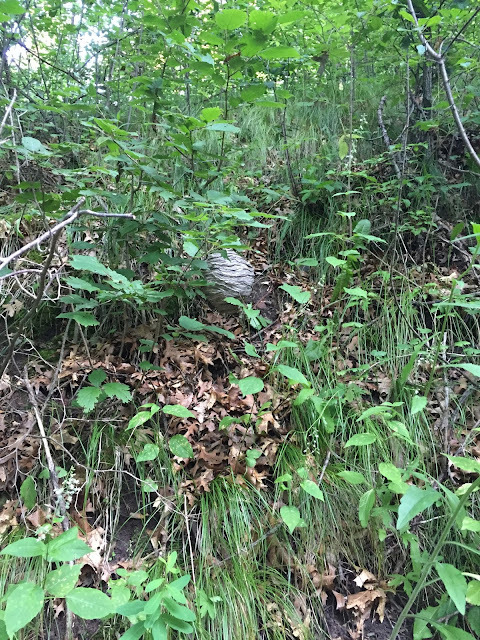 Bald Face Hornet nest. A gray rippled paper pulp hive. The nectar flow is moving forward. There is still nectar plants blooming everywhere. Supers are being added to stay ahead of the bees. The huge rainfall we experienced was great for beekeepers in sandy soil areas. Many times sandy areas have a shortened nectar flow if it starts to get dry. 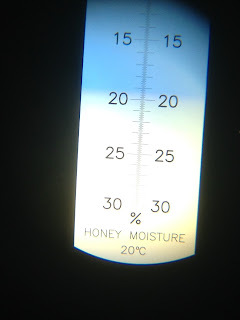 The latest rain and rain in the forecast for late in the weekend should keep the nectar flowing for those beekeepers. The warm temperatures with days in the 80's for the foreseeable future should keep the bees on their honey collection binge. Goldenrod flowers are set around the 4th of July. 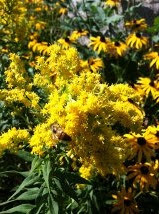 With the big rain we had, there is a possibility of a Goldenrod flow in August. Goldenrod is a fickle nectar flow. 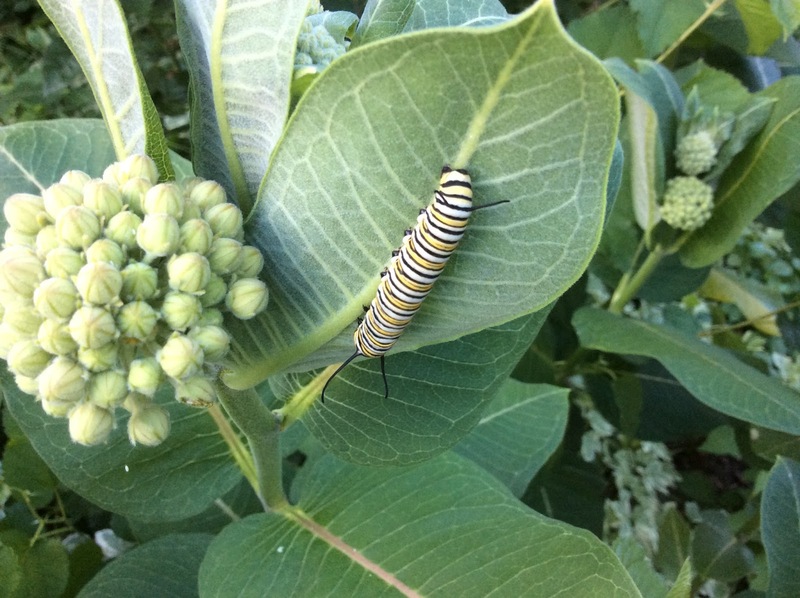 It seems to produce a good amount of nectar only every five years or so. Being that the nectar flow is running on high octane right now. I am thinking the Goldenrod might give us a show as well. I am still getting swarm reports. The swarm calls seem to be easily preventable. 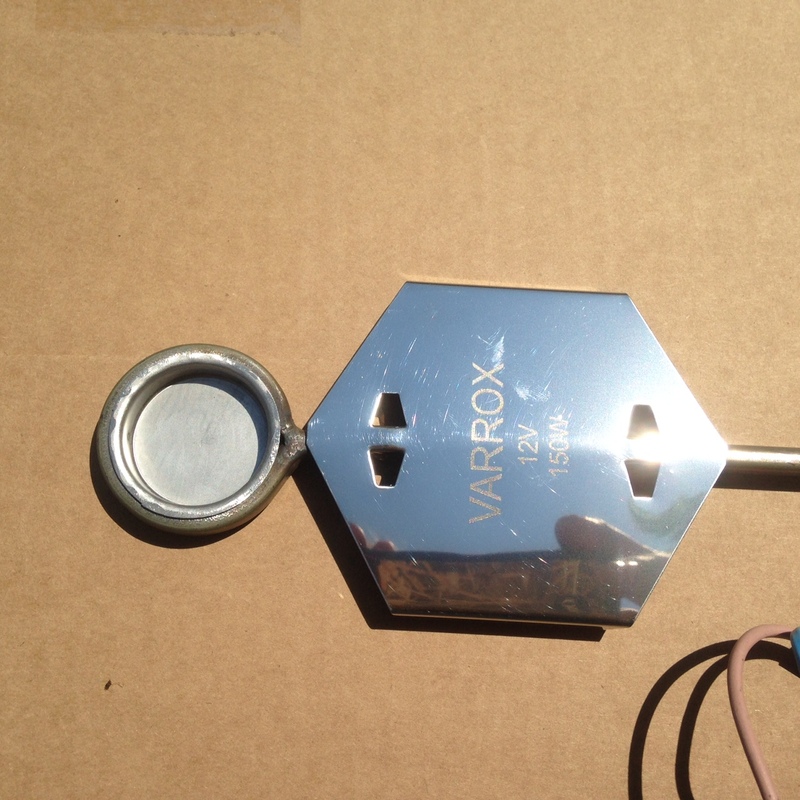 Some beekeepers leaving entrance reducers in, not putting supers on, not checking for swarm cells in June. A beekeeper from Mpls having a hive from hell. She has had four swarms from one hive. Normally when a hive swarms the new queen will run around and kill any other queen in the hive. Sometimes this does not happen. Swarm after swarm will leave over a one week period. Every swarm will be smaller than the next. The swarming stops when the hive runs out of queens. The field bees in the multiple swarm hives are totally depleted. The hive will recover with time but the nectar collection will not be very good. The nectar flow is coming along great, time to think about a plan for harvesting the honey, mite control in August, entering the state fair to show off your new honey crop. This is a hot hive. The beekeeper was concerned if this was a prelude to swarming. But it is 90 degrees out and the hive is hot. Too many days like this can possibly lead to swarming but a hot hive will cool off by Tuesday for sure. A hot hive. 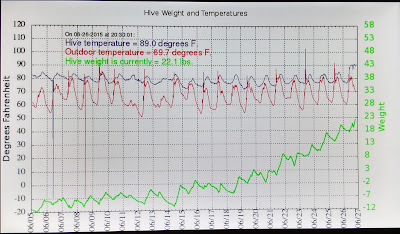 Temperature around 90 degrees the bees will meander out of the hive to cool off. When they start hanging on the bottom board in a clump it is called bearding. Not all of these flowers are nectar flowers. Observation is the key. 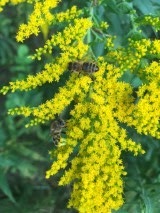 If the bees are working a particular flower they are getting pollen and or nectar from the plant. 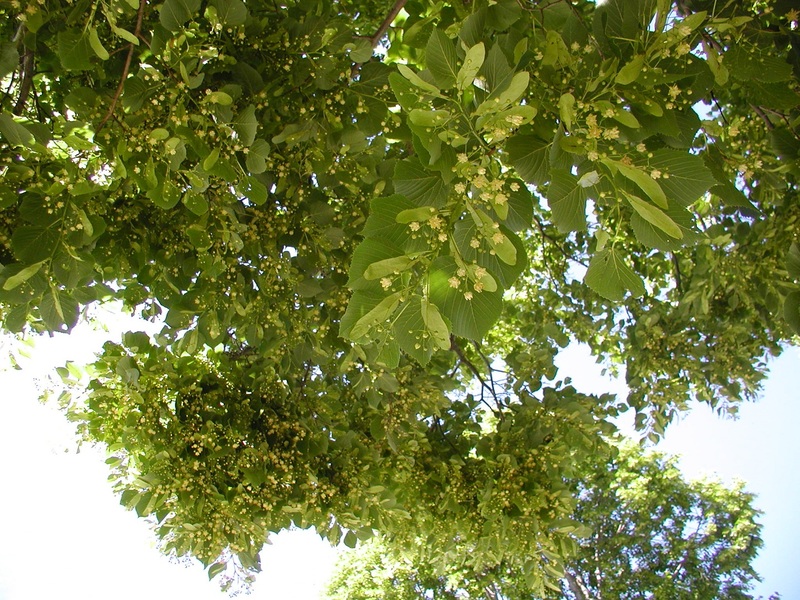 My basswood tree has finally flowered. This honeybee was taking advantage of the available nectar. I am hearing great things about this nectar flow. A beekeeper that keeps bees in St. Paul near the Mississippi river has four capped supers already. That is about 140 lbs of honey. Which equals about 2-1/3 five gallon pails. He is going to extract the supers this weekend and put the supers back on. He started the hive with a package of bees this spring. This nectar flow still has another four weeks to go. Stay ahead of the bees, add supers before the supers on the hive are full. Check supers weekly. When in doubt add supers. Give the bees plenty of room in the supers. If you have two supers on and they are putting any honey in the second super, it is time to add two more. Bees have a hoarding instinct. If there is room to fill they will work to fill that space with honey. 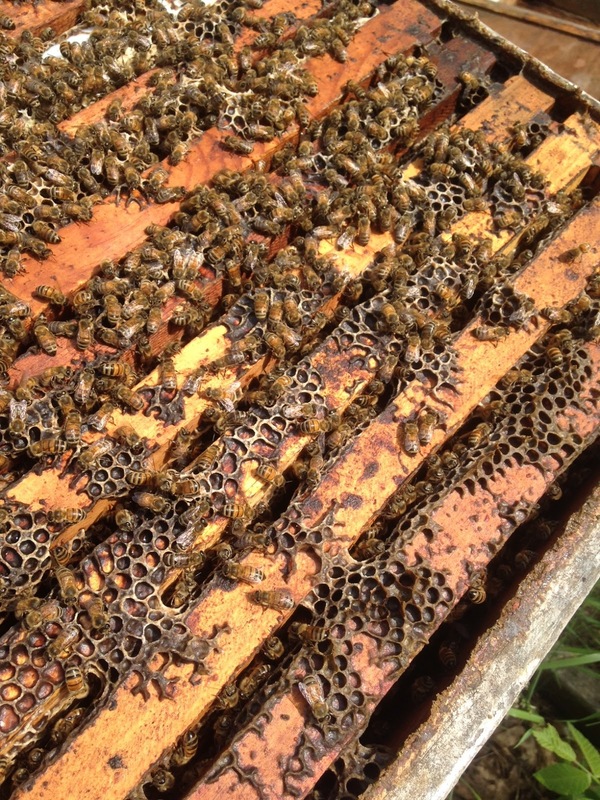 At harvest time,you never want to pull off all full supers off a hive. If all of the boxes were full when they were pulled off, that meant the bees would have made more honey if the space was there to fill. Pulling off one partially filled super off a hive, tells you the bees gave you everything they could get. 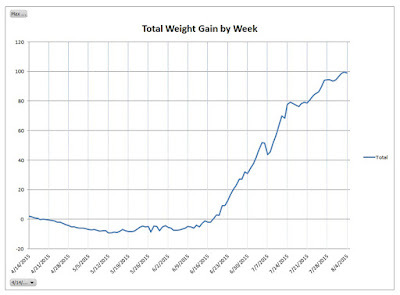 We are at peak nectar flow right now and probably will be for the next three weeks. Good soil moisture, warm days that is the formula for success. I am hearing of widespread honey success, with everyone having a good nectar flow. I drove up to Hackensack, MN yesterday. There was white sweet clover blooming everywhere. So the whole state should be having a good nectar flow.